Ginger ale is a carbonated soft drink flavored with ginger. Ginger ales come in two varieties: golden ginger ale and dry ginger ale. Golden ginger ale, dark colored and strong flavored, is the older style. The drink came from Eastern Europe , where it has been known for centuries, and became popular in USA during Prohibition when dry ginger ale was used as a mixer for alcoholic beverages as the strong flavor of golden ginger ale was undesirable. Dry ginger ale quickly surpassed golden ginger ale in popularity, and today, golden ginger ale is an uncommon, and usually regional, drink. Vernors, Blenheim, A-Treat, Bull's Head, Chelmsford, and Red Rock are brands of golden ginger ale, while Canada Dry, Schweppes and Seagram's are major brands of dry ginger ale. Ginger ale occupies a small niche in the soda market. 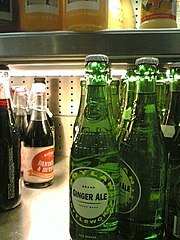 Though in some localities ginger ale is unavailable in vending machines and soda fountains, the drink is a staple on supermarket shelves, in bars, and on airlines. Brands available in North America include Canada Dry, Bull's Head, Canfield's, Hansen Natural, Vernors, Seagram's, Seamans, Schweppes, Sussex, Buffalo Rock, Boylan Bottling Company, Polar Beverages, Ale-8-One, Blenheim Ginger Ale, Foxon Park, Sprecher , Vally, Market Basket/Chelmsford, Red Rock, Reed's Ginger Brew, Thomas Kemper, Blaze, Chek (River of Dreams), and Northern Neck Ginger Ale. Vernors is a flavored golden ginger ale aged for four years in oak barrels before bottling. It was the first U.S. soft drink, originating in 1866, although it was modelled on imported Irish ginger beers. In Detroit , Michigan , a drink made with vanilla ice cream and Vernors ginger ale is called a Boston cooler. The name is not taken from Boston , Massachusetts , where this combination is unknown, but from an establishment on Boston Boulevard in Detroit where it is said to have been invented. Blenheim is a golden ginger ale made in South Carolina; unlike most other brands, it is available in several degrees of spiciness: Old #3 Hot, #5 Not as Hot, #9 Diet, and #11 Ginger Beer. Ginger ale commonly contains ginger, sugar, and carbonated water. Ginger ale can also contain yeast when carbonated with natural fermentation. Ginger content is often listed on labels in a general natural aroma or natural flavoring statement, to preserve secrecy of the complex proprietary mix of spices, fruits and other flavors used. Lemon, lime and cane sugar are the most common of ingredients. Pineapple and honey are also occasional ingredients. Most commercial ginger ales are made with HFCS - high-fructose corn syrup to save manufacturing cost. Ginger ale is used as a home remedy to prevent or alleviate motion sickness, to relieve upset stomachs and to soothe coughs and sore throats. It contains high levels of sugar, which can cause an osmotic shift that can affect the bowels more than the desired effect of the ginger. It is popular in mixed drinks, especially in non-alcoholic mixed drinks. 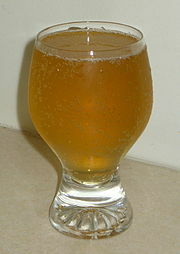 It is sometimes used as a non-alcoholic substitute for champagne, since the beverages resemble each other in appearance. Dry ginger ale is also sold with a mint flavoring added. Popular brands of mint ginger ale include Tom Tucker Southern Style, and Cott (which no longer produces this flavor). Some mint ginger ale brands have an artificial green color added, while others are clear in color. Recently, Canada Dry has come out with a line of ginger ale mixed with green tea. Some manufacturers have produced fruit-flavored ginger ales, including raspberry, cranberry and grape flavored versions of Schweppes. Ginger beer is a similar soft drink that typically has a stronger flavor of ginger, and is less carbonated and less sweet. Homemade ginger beer may contain alcohol. How to make ginger ale from ginger root, sugar and yeast.